The legendary text scroll that set the world ablaze, the musical score that folks would recognize long into the future, and the series of movies that fans would come to love so devotedly that the director's cut would become shunned and spark controversy. That's right, it's time for some Star Wars reviews. Sure, sure, everyone has most likely seen them that actively wants to see them, and in turn already has an opinion on them, but all this site is is my opinion anyways, and sometimes I get it in my head that you guys want to know what I think of a well known movie so you can get a better feel for how accurate my opinions are to yours. Now, to give you a little background here, I've never been a super fan of Star Wars , which isn't to say I wasn't a fan - the movies are highly entertaining and I've built my own lightsaber prop complete with lights and sound - so obviously I like it at least a little bit eh? I'm just saying that I'm not such a huge fan that I've collected memorabilia and read books and done everything related ever - so there's a lot of stuff I don't know about (I didn't even know that Ugnauts were the little pig aliens until proceeding with a Living Review series with a friend). So, that being told, this is strictly about the original (episode IV, V, and VI) series. The plot of this series is immense (obviously, it's covered three separate movies), and yet at the same time sometimes a little bit repetitive. In the general overarching goal, we have the quest of the (good) Rebels against the (evil) Empire. Episode IV starts off with the Empire assaulting a rebel ship that it believes (rightly) to have schematics of the Empire's new secret weapon - a moon sized planet-killing weapon named the Death Star. During this attack, we are introduced to a number of important players such as Darth Vader (played by David Prowse and voiced by James Earl Jones), a leader of the Empire's forces complete with iconic mechanical breathing noise, Princess Leia (Carrie Fisher), the not-so-helpless damsel in distress, and the robotic duo of C-3PO (Anthony Daniels) and R2-D2 (Kenny Baker). The droids escape to the nearby planet of Tatooine, carrying a message from Leia for one Obi-wan Kenobi (Alec Guinness), a respected Jedi (the science fiction version of a paladin, if you really need the comparison) and friend to the rebels. Of course, the droids end up being captured by some alien creatures (known as Jawas) as they trapeze across the desert planet, and then sold to another main character - Luke Skywalker (Mark Hamill). After stumbling across the message accidentally, R2 ends up taking off to go see Kenobi, prompting Luke and C-3PO to pursue. All of this, and we haven't even gotten into the thick of it yet! Luke learns from Obi-wan that his father was a Jedi who was killed by Darth Vader, and upon returning home Luke finds his family murdered by the Empire, who are in pursuit of the droids. Thus Obi-wan and Luke start their quest to return the droids to the rebels - which leads them to a nearby space port of Mos Eisley where they requisition a space craft to leave planet (and also our first sample of usage of the force ). We meet another pair of important characters here - the rouge smuggler Han Solo (Harrison Ford) and his wookie companion Chewbacca (Peter Mayhew), who have the fastest ship in the galaxy (the Millennium Falcon). They take off for the planet Alderaan, which just so happens to have been destroyed in a display of the Empire's new Death Star's power. Coming out of warp speed into an asteroid field, the crew of heroes aboard the Millennium Falcon finds themselves trapped by the Death Star's tractor beam. It is here that another string of events occurs, leading to the rescue of Leia by the gang of heroes, and the "death" of Obi-wan at the hands of Lord Vader. The rest of Episode IV is the quest to destroy the death star. Episode V focuses more on Luke's journey to become a true Jedi like his father (under tutelage of Jedi master Yoda (voiced by Frank Oz) and the continued resistance of the rebels, but carries with it a much more desperate tone - things look bleak for the rebels constantly through out this movie, as they fight loosing battles and are constantly on the run. 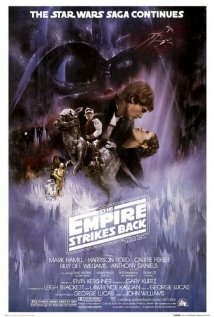 By the end, even fan-favorite Han Solo finds himself in a dire situation as he's encased in carbonite by his friend Lando Calrissian (Billy Dee Williams) - who is left no real choice when Vader employed bounty hunter Boba Fett (Jeremy Bulloch) arrives before the heroes - when the crew (minus Luke) seek refuge from the empire there when the Falcon's warp drive is damaged. Even more impacting than that ordeal, however, is the the one stunning reveal that is misquoted by generations to this day (if your wondering, he doesn't start it with "Luke"). "If you only knew the power of the Dark Side. Obi-Wan never told you what happened to your father." Episode VI marks the final installment of the trilogy, and it strives to wrap up its loose ends while ending the movie with a thrilling climax that has done nothing but build over the years of audiences waiting for it. We are introduced to our final player - the Emperor (Ian McDiarmid)- as more than just a hologram, and the lovable species of teddy bears known as Ewoks. It's well worth all the build up, giving us the rescue of Solo (and all the ways it goes wrong before hand), the final assault on the Empire, and a very energetic and heartfelt final battle between Luke, Vader, and the Emperor. It amps up the dramatic feeling of the plot, keeping the rebel's fight feeling desperate so that it really implies that if they are to succeed, it's now or never. By the end, I think it deserves it's labeling as a Space Opera Epic. The actors in this do a wonderful job with their lines, and even in it's oldest forms one never really runs into a problem with the balance between lines and background noise. 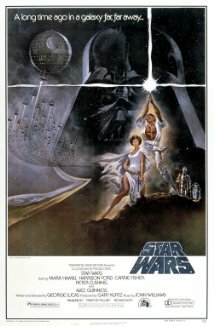 The scores provided (particularly the Imperial march, the main theme, and the Tantooine Cantina music) are easily recognizable and people still hum them to this day for various reasons - a prime example of how easy it can be for a good score to leave an impression on a person when combined with a good movie. The characters themselves are a nice spread of personalities (and races) as well, adding to the distinct feel amongst the actors as they deliver their lines (Han Solo, for example, always sounding a bit boastful and sly). There is another bit to this that I have to get into, but will wait for later - as in a rare case (boy, do I hope it stays rare) the special editions do make some changes that should be brought up. Special effects here were also top of the line for the time - a mix of suits, puppets, models, and all manner of "lights and magic" taking center stage. Yes, by today's standards some might frown upon some of it (there are a few instances in fights where you can notice a hit not landing at all as far as choreography goes, or something might look particularly like a toy model), but at the time this was probably mind-blowing (which does make me slightly jealous of the folks who saw this back during it's original theatrical release). I can appreciate this sort of thing, because I'm a large fan of practical effects - stuff like those model spaceships and real physical props add a charm and longevity to the effects that aren't always possible with more computer-oriented effects. Costumes are also a diverse and excellent thing, and even the most mundane of outfit (like Han's for example) has this other-worldly feel to about it, lending to the credibility of "a galaxy far, far away." On the other end of that spectrum, we have things like Chewbacca's suit which is both impressive to behold and at the same time somehow not bizarre - almost as though you could get used to seeing it. From lovable Ewoks, to mysterious Jawas, to monstrous Rancor beasts, the series did a wonderful job of displaying a massive set of imagination. Of course, this also ties in with audio, as the later-released special editions did some things I feel need to be talked about. Mon Calamari: Admiral! We have enemy ships in sector 47! Admiral Ackbar: It's a trap! Now, everything I have said was more pertaining to the original release. The special editions made some changes, most of which everyone except George Lucas himself abhor . Now, before I get to how I feel about the specific items themselves, let me elaborate on my feeling of the overall subject: taking into consideration that the movies are the product of the person who made them, if they want to release a different version that better entails their vision of what it was supposed to be (such as Director cuts, where scenes filmed but cut for whatever time/pacing/rating reasons are added back in), then I'm all for it. Even to a small extent, I'm okay with some of the changes made in this particular case - a bit of extra nonsense to carry from point A to B in travel? Sure, whatever, doesn't bother me a bit. What starts to get to me though, is going in and altering the originals just because you made a new one, particularly in ways that don't really make any sense. An example of this? Boba Fett's voice. Yeah, you might not have known that, but the most recent version's of V and VI don't use the original voice of Fett (which was superior in my opinion), but instead had it re-dubbed by the actor for Jango Fett from the new-3 films (why would Boba sound exactly like his father anyways?). For sure, it's a trivial thing - the character is still cool, and the movie still functions fine, but it's for that reason that it annoys me - it is totally, one-hundred percent not necessary in any way shape or form, outside of just removing credit from the original actor. Some things, like adding in a scene with Solo talking to Jabba before take off work fine, its just a rather poor execution of CGI that causes it to stick out like a sore thumb (as opposed to just leaving it be one of Jabba's minions doing the talking, which worked just as well). Although it's not necessary, that much at least has more of a feel that it's there to add to the plot, which is more than the voice-changing bits. A scene similar to this is the "Solo shot first" debacle. You see, in Lucas's mind Solo is a hero, and shouldn't have shot first, and he never meant for it to seem that way - and when he changed it in the special everyone flipped their wigs about it. Seriously, if watch the scene, solo still shoots at latest at the same time as the alien Greedo, and it doesn't in effect change his character in my mind (yes, for the record it was cool when he shot first, and the entire scene flows more smoothly in the original take). Another bit that doesn't make a whole lot of sense is the rather poor job of putting the actor who played a younger Vader in the prequel series onto the face of Vader's "ghost" at the end of the movie. It make's no sense logically - every other ghost is the ghost of them as they were when they died, yet for some reason Vader got younger after he died? It's just a silly thing to waste time on - especially when you have so many people as die-hard fans of the original un-tweaked ones. Overall, I think anyone and everyone should at least try and give the (original) series a shot. I would highly recommend the originals if you can manage to find them, simply because it flows the best (most of the trivial changes no longer exist, and it also spares you of a terrible song and dance number I think was meant for kids in the third act), so it's less of a time investment for those worried about not liking it. The original series is what started the fandom, and it seeps at the seams with magic, exploration, wonder, and swords made out of light, without beating you over the head and making you feel stupid for watching it as an adult (as did a lot of the new-3). You might even learn some valuable life lessons if you get real deep into it, but for certain you should at least find yourself entertained by the creative spark before the raging fire. Whatever your decision is, may the force be with you.